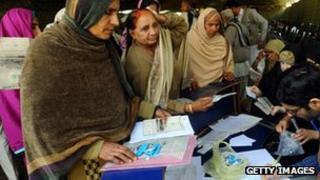 Image caption Patients who still had supplies of the faulty medicine have been returning them. More than 100 people have now died in Lahore after taking contaminated heart medicine, Pakistan officials have said. The deaths, which span a three-week period, are linked to a batch of faulty drugs given to up to 40,000 cardiac patients at a government-run hospital. Another 250 people remain in hospital while an investigation into the situation gets under way. The owners of three local drugs companies alleged to have supplied the contaminated drugs have been arrested. Government official Shahbaz Sharif said the victims tended to be poor people who had received the drugs free, the news agency AFP reported. He said action would be taken against anyone found guilty. Samples of the drugs had been sent to laboratories in Pakistan, London and Paris for testing. The deaths caused panic in the city less than three months after a dengue fever epidemic. Officials have warned that the batch of contaminated drugs might have been distributed to nearly 40,000 people since 15 December. They say that patients affected by the substandard drugs suffer a rapid depletion of white cells and blood platelets. The symptoms - first noticed in late December - created an impression that patients were suffering a form of dengue fever, a mosquito-borne disease common in Pakistan during the monsoon season, officials say. But patient data soon revealed that all of those affected were heart patients who had been using free cardiovascular drugs from the government-run Punjab Institute of Cardiology. On Wednesday relatives of the dead and sick told the BBC how their families had suffered. Parveen Bib showed the BBC her father's death certificate and said: "My father died on 23 December after taking the contaminated medicine. There was bleeding from his mouth and also bleeding from his urinary tract." Asim Saeed said: "All patients are suffering from bleeding from the mouth and urinary tracts. We have been in the hospital for seven days but no-one came to check on us. They would sneak in quietly - doctors would check patients and go away." Officials said one or more of at least six drugs - all manufactured by little-known local firms and purchased by the Institute of Cardiology for heart patients - may be responsible. Officials of the Federal Investigation Agency (FIA) told a court in Lahore on Wednesday that the drugs did not carry dates of manufacture and expiry. The court has remanded in custody three people who own pharmaceutical firms which supplied the drugs to the Institute of Cardiology. The owners of two other companies are being sought..
None of the firms has commented on the allegations.